The official coat of arms for our large family was unveiled at a brunch held at the Monsignor Marcoux Centre on October 21, 1990. The coat of arms was designed by Reverend Lucien Godbout, a heraldist, from the Seminary of Québec. A blue background with a golden chevron accompanied by three lilies adorning a rod with four pendants; a plough, and four stalks of wheat; and, also, a dove holding in its beak an olive branch above three waves, all in gold. The background of the shield is blue, the official color of Québec and of France, it is sky blue. The chevron, an inverted "V," is a device intended to divide the shield into three parts. On the left three lilies adorning a rod with four pendants; this has its origins in the coat of arms of Artois, an ancient province of France which was the birthplace of our ancestors. On the right, a plough surmounted by four stalks of wheat. The plough represents the heavy labor undertaken by our ancestors to clear the ancestral land. The fours stalks of grain represent the fruits of the labor of the four Robitaille brothers: Jean, Nicolas, Pierre, and Philippe. And, in the centre, is the dove with the olive branch, taken from the coat of arms of Theodore Robitaille, who was the lieutenant governor of Québec, and certainly the most renowned ancestor of our family. A symbol of purity and peace, the dove also signifies the descendants. Finally, the three waves represent, respectively, the Saint Michel brook from our ancestral land, the St. Lawrence River which crosses our homeland, and finally the Atlantic Ocean which our forebears crossed with great difficulty to establish themselves at Champigny. We can also see here the furows of the work of our ancestors, sons of a laborer. For the bright color we chose gold which comes from Theodore Robitaille's coat of arms and, at the same time, this color adds a touch of our branch in France, since gold was used in the coat of arms of William Robitaille, Dean of the Canons of St. Peter of Cassel around 1701. And we, in turn, thank Father Godbout for his beautiful heraldic work. There remained the need for a motto to complete the coat of arms. A contest was organized for our members and an adjudication panel was formed to decide which of the proposals submitted was best. 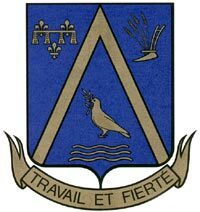 The motto selected was WORK AND PRIDE (TRAVAIL ET FIERTÉ), submitted by Mrs. Béatrice Robitaille Ferland.